The Equitable Life and Casualty Company has been providing quality insurance since 1935. 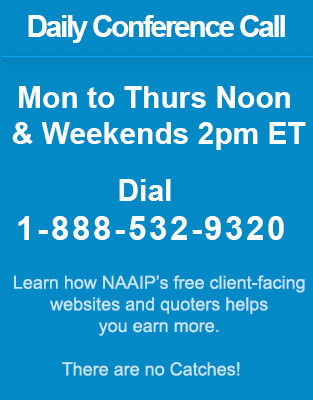 Contract through NAAIP and sell their popular Medicare Supplement and Hospital Indemnity products at the guaranteed highest commissions. Customers and agents alike find Equitable Life's service to be personal, friendly and professional throughout the United States. Available in all states except AR, FL, MT and WA. Equitable has offered products to the senior market since Medicare was first established. It offers three plans - A, F and N to all qualified seniors seeking supplemental health insurance. Equitable offers instant coverage to clients as all policies on offer have no waiting period. Customer service is highly praised as most claims are settled in less than a week. Equitable's aim is to be the leading life and health insurance provider for the senior market, a group they term as "The Ultimate Generation". They intend to achieve this by continuing to adhere to their principle of equal and fair treatment and a genuine concern for the welfare of their policyholders. Graded Plan available with 3 year Grade. Graded Plan: $2,000-$10,000 of coverage. Graded Plan: If death within one year - return of premium plus 5%. Graded Plan: If death in year two - return of premium plus 10%. Graded Plan: If death in year three - 75% of benefit is payed out. Graded Plan: Accidental death is payed as full benefit. Three Levels of Benefits - Premium plan till $500 per day for 90 day benefit. Additional payments for hospitalization, tests, visits, surgery , anesthesia, surgical opinions, blood, radiation, chemotherapy, prescriptions, medication, hospice care, prosthesis, ambulance and travel costs. Daily benefit from $50 to $300 per day. From 100 days to 350 days of benefits - You choose. Elimination period of 0, 30 or 90 days. Maximum benefit of $105,000 at $300/day for 350 days.